Deep below the market, in the dark tunnels no human knows exist, a war has begun. Lead by the charismatic Beloved Chairman, a colony of rats plots to exterminate the ugly two-legs who have tortured them in labs, crushed them with boots, and looked at them with disgust for as long as anyone can remember. Something moved. Ananda stifled a scream. A small lump quivered under the window, in a mess of metal and fur. Her dadâs trap had caught something. She moved closer. The creatureâs eyes were half-closed. Soot-grey fur capped its head and ran down its back. White fluff trembled between steel jaws. And then she saw its tail: naked and pale, stretched out like a bristly snake. Ananda jumped back. The thing twitched and its eyelids fluttered, but it sank back onto the floor, ribs heaving. She crept closer. Her shadow flickered across the creature. It squealed, thrashing against the trap. Fresh blood seeped onto the concrete, adding to the dried pool already there. Ananda stepped back and the rat went still. Wearily it closed its eyes. Its head slumped down. What was she supposed to do now? Was it somebodyâs pet? It looked like the rat from the market, but that was impossible. Ananda leaned forward to see how badly it was hurt. The rat went crazy again. It squealed shrilly, biting at its trapped leg to free itself. âOkay! Okay!â she said, and moved back. This was not someoneâs pet. It was wild, no matter how it looked. And that meant it might have fleas. Fleas infected with plague bacilli. Backing up the basement stairs, Ananda turned and raced out the back door and to the shed. She hauled open the rickety door and scanned the shelves. There were thick gardening gloves. She put them on. A dusty cinder block sat on the shed floor. She picked it up, staggered back a step under its weight, and waddled into the house and back down the stairs. Standing over the rat, she gripped the cinder block with both hands. Sheâd try to make it painless. Fin couldnât move. His hind leg felt bitten in two. Some evil thing had its teeth into him. Why didnât it just kill him? What was it waiting for? The floor was cold. A chill crept through his fur, into his bones. The red curtain of pain shifted. He thought, drifting, Itâs not so badâ¦. The peaceful dark was shattered. Buzzing light split the gloom. Red pain bit into him again. He pressed his eyes closed, trembling. A shadow moved over him. Fin opened his eyes a crack and saw two boggle eyes staring down at him. He thrashed against the cold teeth. Bit at his leg to free it. âHelp! Help! Papa!â he screamed. The bulbous eyes floated away. Panting, Fin stopped, listening. He couldnât see it, but the thing was nearby. He could hear it breathing. Lifting his nose, he feebly scanned the air and froze. There it was, an odour rank and pungent: two-leg stench. The eyes hovered close again, its foul smell filling Finâs nostrils. He shrieked, âLet me go! Let me go!â yanking at his pinned foot. Once again the ugly two-leg moved back. Was it toying with him? Like a cat toying with a mouse? Barely able to make out its blurry shape, Fin threw ultrasonic screams at it, calling it every insult he could think of, but his cries fell like stones, unheard. The thing was too brutish to understand him. He was grateful Papa couldnât witness his shame. He was no Hero of the Tunnels now. When the two-leg stood over him one last time, Fin did not feel a thing. He had already fainted. 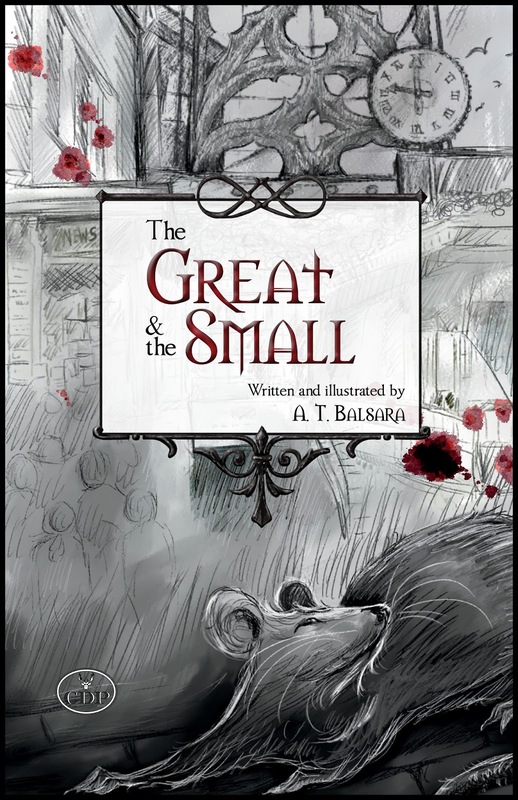 Thank you for hosting A.T Balsara and The Great & the Small!